CHICAGO – Andrew Dominik delivered one of the best movies of the ’00s the last time he worked with Brad Pitt when the two made “The Assassination of Jesse James by the Coward Robert Ford.” And so there was intense anticipation for their follow-up collaboration, “Killing Them Softly,” recently released on Blu-ray and DVD. Call it a sophomore slump but “KTS” is a film with tons of style and some interesting ideas that nonetheless feels like a dirge and plays like a film twice as long as its running time. Based on “Cogan’s Trade” by George V. Higgins (the name change is the first thing to raise eyebrows), “Killing Them Softly” attempts to graft a commentary on our increasingly dire economic times with a thriller about a mob hitman with a trio of assignments. Pitt plays the guy brought in to clean things up when a couple of numbskulls (Scoot McNairy & Ben Mendelsohn, so great in “Argo” and “The Place Beyond the Pines,” respectively) decide to hit a high-stakes card game. Not only do they have to be hit but so does the card game manager, who happened to run his own heist years earlier. When the economy crashes, it’s not just the guy who crashed it but the guy in charge who has to take a bullet. Everyone in “Killing Them Softly” is acting out of selfishness. Robbing the game, putting out hits, taking those assignments — it’s all a cold, calculated attempt at financial gain. This kind of bleak storytelling works in fiction but is a tougher sell in film. To be blunt, I didn’t give a damn about anything in “Softly” outside of a filmmaking exercise. It’s well-made, very well-performed, and stunningly, memorably boring. Weinstein knew that they had a problem, pushing the film back a few times, not sending screeners to critics groups for year-end consideration, and, now, putting almost no special features on what is a lackluster Blu-ray release for a lackluster film. Brad Pitt makes very few mistakes in his career. Consider this the exception. Brad Pitt delivers an explosive performance as Jackie Cogan, an enforcer for the Mob in Andrew Dominik’s gritty yet stylish crime thriller Killing Them Softly. Cogan must restore order in the criminal economy after a Mob protected card game is heisted by a group of inexperienced crooks. Brad Pitt stars along with Richard Jenkins, James Gandolfini, Ray Liotta, Scoot McNairy, Ben Mendelsohn, Vincent Curatola, Max Casella, Trevor Long, Slaine and Sam Shepard. 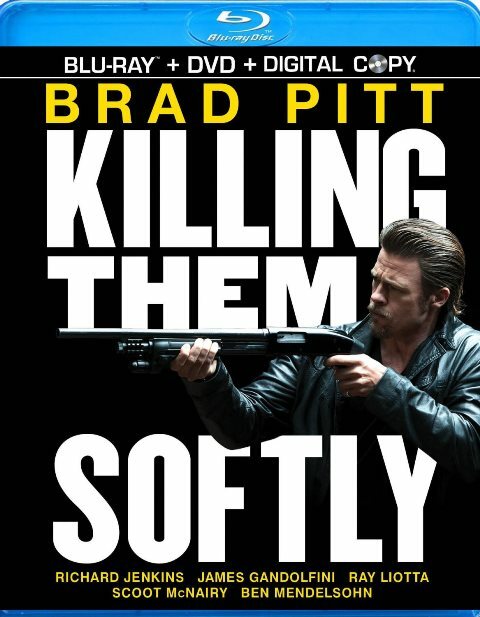 “Killing Them Softly” stars Brad Pitt, James Gandolfini, Ray Liotta, Richard Jenkins, Scoot McNairy, and Ben Mendelsohn. It was directed by Andrew Dominik and released on Blu-ray and DVD on March 26, 2013.